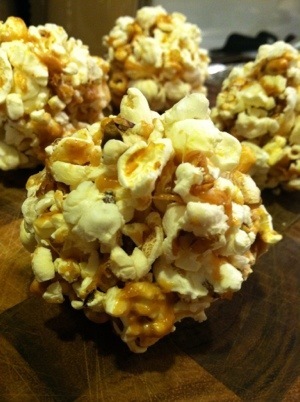 The easiest healthy snack has always been popcorn. Since it’s the best go-to gluten free snack I wanted to try something new with it. 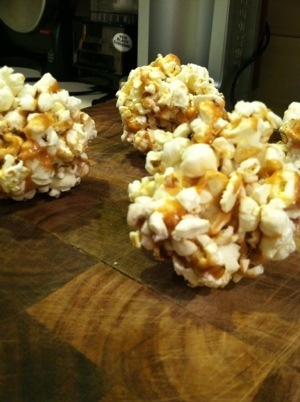 Popcorn balls are super easy and fun to do with kids. Add anything you want. Try your favorite candy or some healthy nuts. Maybe colored sugar or sprinkles for a great holiday treat. With Halloween around the corner adding some candy corn could make this a great alternative to the pounds of candy kids consume. Simply melt peanut butter and marshmallows in an oiled pot on medium low heat. It will happen fast and need to contently be mixed. As soon as it melts pour over popcorn in a large bowl. Mix together well by hand. Don’t worry about breaking the popcorn because it will all stick together. The mixture hardens quick so work fast. Form balls with mix just like you would a snowball, pressing together firmly. The size of each ball will vary depending on hand size but you should get about 8 out of this mix. If you follow this recipe exactly they each are under 90 calories. Great for after school snack!